Suggested Use: 1 to 2 capsules in the afternoon or as directed by a health care professional. Pregnenolone has nothing to do with being pregnant, and everything to do with well-being. Pregnenolone is the master steroid hormone from which whole families of other hormones are made. For example, testosterone, estrogens, progesterone, and cortisone, are all derivatives of pregnenolone. But pregnenolone is also an important brain neurosteroid — a hormonal substance that is formed and accumulated in the nervous system and is active there. As such, pregnenolone is involved in learning and memory, aggression and epilepsy, and modulation of responses to stress, anxiety and depression. generally improving the quality of life. These effects occur after about two weeks of pregnenolone usage. 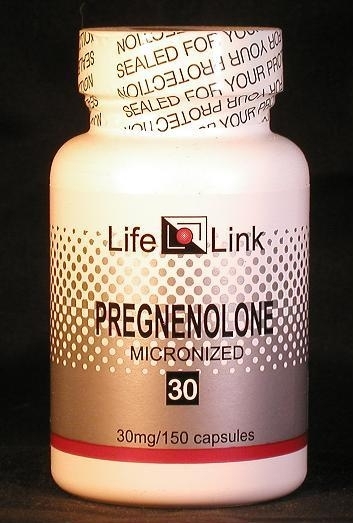 Pregnenolone is a prohormone used by the body to produce other steroid hormones, such as testosterone, estrogens, progesterone, cortisone, and many others.1 But pregnenolone is also an important brain neurosteroid2 — that is, a hormonal substance that is both formed and accumulated in the nervous system and is active there. As such, pregnenolone is involved in learning and memory, aggression and epilepsy, and modulation of responses to stress, anxiety and depression. Accordingly, we will limit our discussion of pregnenolone to a brief summary of relevant research, and let you draw your own conclusions about what medical conditions it may be effective in treating. In the 1950s, however, a raft of new stimulants, painkillers and anti-inflammatories hit the market, and pregnenolone simply got swept into the backwaters of the pharmaceutical world as the medical profession got caught up in the excitement of new drugs and the money they bring in. It was later discovered that the long-term use of these newer drugs led to serious side effects, but by then pregnenolone had become an unfashionable research topic. During the past two decades, however, pregnenolone and its sulfate ester have been receiving renewed attention. Many scientific studies give strong experimental support to claims that pregnenolone can be used to enhance memory and reduce stress. There is also evidence that it lessens depression,3 controls ‘bipolar disorder’,4,3 and reduces schizophrenic symptoms5. The term ‘neurosteroid’ was introduced in the 1980s to refer to pregnenolone and other steroids that can be produced in the brain. Since then, hundreds of studies have been published about these substances and their potential value as treatments for psychiatric illnesses. When pregnenolone is taken orally much of it is absorbed from the digestive tract. Some of it is immediately converted to pregnenolone sulfate which dissolves in the circulating blood, some of it remains unconverted and is thought to be transported in the blood by a carrier protein. When it reaches the brain, some of the circulating pregnenolone and pregnenolone sulfate passes through the blood-brain-barrier into the nervous system,78 Hence, oral supplements of pregnenolone can elevate the concentrations of pregnenolone and pregnenolone sulfate in the brain beyond what the brain would do on its own. whereupon further conversion of pregnenolone to its sulfate is carried out. But does pregnenolone really enhance memory when you take it orally? Incredible as it may seem, neither the medical research establishment nor the supplement industry has bothered to do a clinical study and publish the results. The studies that were performed and published in the 1940s showed definite improvements in mental functions, but they did not specifically measure memory enhancement. One study of memory enhancement is said to have been done recently at the St. Louis School of Medicine, USA: 500 mg pregnenolone or a placebo were given to volunteers three hours before they performed standard memory tests. “Pregnenolone resulted in improved memory in both men and women, improved spatial memory and perception in men, and improved verbal recall memory in women.”2 The work, however, has not been published in a medical journal. But we do not have to wait for formal studies to be done before we can reap the memory benefits which pregnenolone presumably has to offer — this supplement is available, affordable, and safe to use in the amounts that are typically recommended for memory enhancement: 50 to 500 mg/day. Studies in patients with anxiety disorders have shown that higher anxiety levels correlate with lower pregnenolone levels in the blood.11,12 More to the point, experiments with mice demonstrated that when pregnenolone sulfate is administered directly to the brain, anxiety symptoms decrease.13,14 But at very high doses (10 to 100 times the effective dose), mice experienced increased anxiety. The one published clinical study that has been done in humans used very low oral doses of pregnenolone (15-30 mg/day) and showed no effects on anxiety,15 thereby establishing a lower bound on the effective dose range. In view of the studies on mental function done in the 1940s, these results suggest that anxiety therapy using pregnenolone may require doses in the range of 50-200 mg/day. It was reported in 1994 that patients with bipolar disorder have depressed pregnenolone levels in their cerebrospinal fluid.3 Since then, dozens of studies have been performed in mice and rats in an effort to understand how neurosteroids affect brain function. Many investigators have concluded that these substances hold great promise as treatment options for psychiatric illnesses, including depression and bipolar disorder.16,1718 Yet, to the discredit of the psychiatric profession, only one clinical trial has been conducted to test this concept and the results have not been published. Are pregnenolone supplements useful for the conditions and purposes mentioned above? We aren’t allowed to tell you, so you should take a look at some of the references cited here, and then decide for yourself. Warning: Pregnenolone should be avoided by those who are at risk for hormonally related cancers, or who are lactating or pregnant.